Join my quest for the best travel experiences on the planet. If you love chocolate and travel … you've definitely come to the right place! To learn more about me, scroll to the bottom of your screen and click the "About" page. And please remember … all articles and images are copyrighted by me. Please do not reuse without my written permission. Thanks so much. Enjoy your travel diversions with Doreen here on the first and third weeks of each month. In between blog posts, be sure to check out my all-about-chocolate li-paper, "Chocolatour News" at http://paper.li/wizardofwords/1310439305. It's published daily! Hey there! Thanks for dropping by Travel Diversions with Doreen! Take a look around and grab the RSS feed to stay updated. See you around! Being one who has the good fortune to travel often and quite extensively, I have made many dear friends in other cities, and would like to thank my dear friend, Virginia, of Toronto, for having sent me the best birthday present this chocolate-loving girl could ever hope for: SOMA chocolates. Virginia knows good chocolate as she and I visited three European countries last fall and ate chocolate until we had to resort to storing it in our cheeks because it wouldn’t go down. For those of you who have never tasted the ecstasy known to me as SOMA chocolate, you are truly missing out. It is without doubt, the best Canadian-made chocolate I have ever eaten. I adore their dark chocolate truffles filled with ganache made from poignant flavours such as Douglas Fir tree sap, bergamot, Arbequina Spanish olive oil, 8-year-old balsamic vinegar, and local Canadian whisky. They are artistically designed and made from cocoa beans roasted and ground right on the premises. Virginia was kind enough to send me 2 of SOMA’s delicious mini bars. Just 65 grams each and divided into tiny squares so that those who feel they must practice restraint can easily do so. Unfortunately, SOMA chocolates are best eaten within 10 days of purchase, so I’m just doing my duty in making quick work of it. And yes, my dear chocolate-loving friends, eating chocolate is indeed work for me. I am one of those lucky individuals who LOVES my job! On my chocolate quest to Toronto this week, I shall be making a trek to SOMA chocolatemaker to indulge in their single origin truffles. It’s been a year since I’ve been to their shop and I’ve eaten truckloads of high-end chocolate from all over the world during that time. I’m now ready to put SOMA’s single origin truffles to the test against Norman Love’s BLACK collection. I can’t imagine anything being better than them, but then … I haven’t yet experienced SOMA’s product of quite the same grade. That’s the thing you’ll learn after eating a lot of great chocolate. 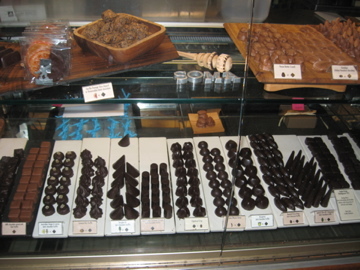 There are often several different grades of chocolate right within the same small shop. 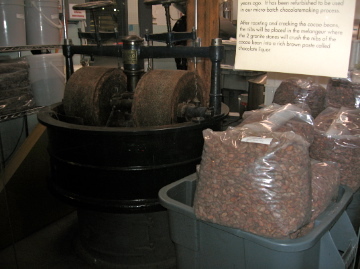 As in the case of SOMA, Norman Love and other fine chocolate makers … they are all good. But it is when you get to the purest of chocolate such as the single origin truffles, that you get the flavour, texture and appearance that sets the best several grades above the rest. To me, really good chocolate is never too sweet, too bitter or too gritty. It should be silky smooth (in texture), pure (in ingredients) and intense (in flavour.) And I know I will always find that in the remarkable quality of chocolates I get from SOMA chocolatemaker of Toronto. I’m actually going to Toronto this week for the annual conference of The Writers Union of Canada (TWUC.) It will be my first time attending a national TWUC event and I’m looking forward to it. Following that, I and my next chocolate-tasting partner in crime, Suzanne Boles of London, Ontario, will be taking the Chocolatour to London, England to meet with some amazing British chocolate makers. So we’ll have lots to talk about in the upcoming posts. Join me back here the week of June 6th for the next post. But until then, let’s talk! What has been the best chocolate that has ever passed your lips? This blog has moved. Follow my Chocolate Blog at diversionswithdoreen.com.